The Spanish colonies of the sixteenth century had gold fever and in hardly a fortnight Cortés had two ships, a brigantine and 300 men. Velásquez became concerned about the scale of Cortés' preparations and feared losing control over the expedition and sent orders to relieve Cortés of his command. But Cortés' brother-in-law killed the messenger and took the governor's papers to Cortés. Alerted to Velásquez' plans, Cortés now moved fast. Having seized all the meat supplies in Santiago, he decided to set sail at daybreak on February 18, 1519. Velásquez hurried down just as Cortés was pulling away in a small boat. Cortés ignored his protestations and gave orders to sail. The crossing from Cuba to the Yucatan is only 120 miles, and Cortés coasted down to Cozumel, where, for the first time, he saw the Mayan pyramids, with their thatched sanctuaries on top. Almost immediately, he had an incredible stroke of luck. The people of the island told him that in the next-door land, known as "Yucatan," there were two Christians who had been carried there a long time ago in a boat, and held as captives. One of those men was Geronimo de Aguilar, who had been shipwrecked near Jamaica in 1511. Thanks to Aguilar's survival, Cortés now had a translator who could speak the local Mayan tongue. 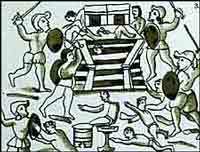 Cortés continued round the tip of the Yucatan and disembarked at Potonchan, where the natives gave him small offerings of food and a gold mask, but then asked the Spanish to go: ''We wish neither war nor trade,'' they told Cortés. ''We have no more gold - you will be killed if you do not leave.'' Ultimately, the conversation ended in a battle in which 400 Indian warriors were driven off with heavy losses. The Indians submitted and gave the Spanish gifts, including 20 women to cook tortillas and serve them. Cortés discovered that one of these women, named Malinali, or Malinche as she is generally known, spoke both Mayan and Nahuatl, the Aztec language. Cortés had stumbled upon the key to his ambitions - through Geronimo de Aguilar, he would be able to talk to Malinche in Mayan, and then through her speak with the Mexicans in Nahuatl.